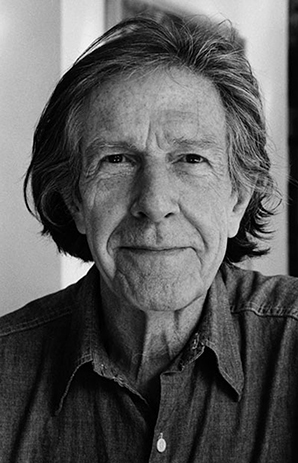 You are currently browsing the tag archive for the ‘John Cage’ tag. I have been a long time fan and admirer of Cage. But Larson’s book shortened the distance between the myth and the man himself. As is often the case with any good biography, you walk from the reading with a connection that feels personal and almost intimate. That may be imagined, but something in me has shifted permanently. And that’s the gift. So it is time to begin again. Summer is now, for us Americans, officially over. Here in Boston the students are back, a transition that is as difficult for these late adolescent invaders as it is for those of us who are here year round. (We are pretty sure that every U Haul truck in operation was blocking a street somewhere within one mile of Commonwealth Avenue this last weekend….) The nights are cooler, the days are shorter. So begins the perennial reminder of those rhythms larger than us, of moving from out to in, of the silent synchronization, unrehearsed, that strips down minion trees to their winter underwear. So here are a few quotes from Cage that were helpful to me this morning. Please feel free to add some of your own. What I’m proposing, to myself and other people, is what I often call the tourist attitude – that you act as though you’ve never been there before. So that you’re not supposed to know anything about it. If you really get down to brass tacks, we have never been anywhere before. I can’t understand why people are frightened of new ideas. I’m frightened of the old ones. As far as consistency of thought goes, I prefer inconsistency. Art’s purpose is to sober and quiet the mind so that it is in accord with what happens. What right do I have to be in the woods, if the woods are not in me. One shouldn’t go to the woods looking for something, but rather to see what is there. Out of the work comes the work. Where the Heart Beats: John Cage, Zen Buddhism, and the Inner Life of Artists by Kay Larson has been my mainstay for the last several weeks. Every page has now been marked and annotated, leafed through many times. This is an unforgettable, inspiring, deeply moving book about a towering and yet famously accessible figure. 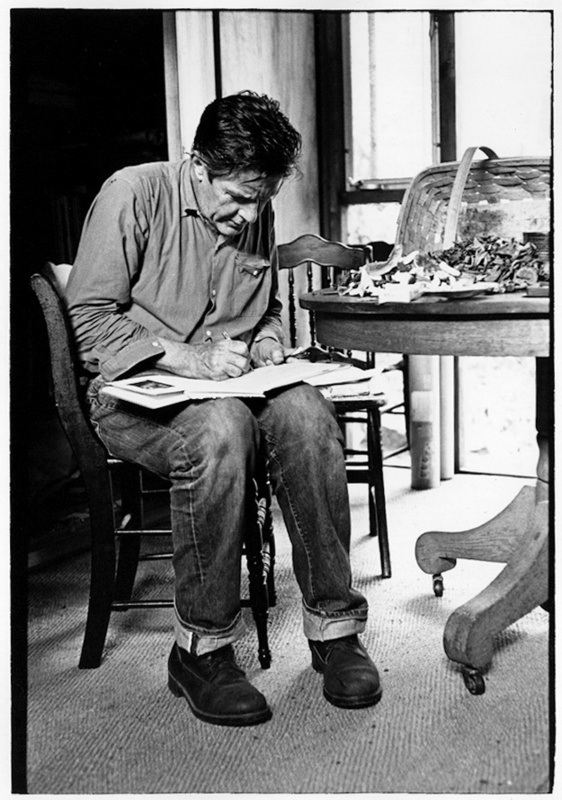 Larson weaves this story through written words by John Cage himself and the historical evidence of the network of extraordinary people that Cage knew, learned from, influenced and collaborated with. For anyone interested in 20th century culture, art, dance, music, cultural history, Buddhism, Eastern thought or the varieties of spiritual experience, put this on your list. Larson is an art historian (longtime denizens of Boston may remember her writing for The Real Paper before moving on to Artnews and New York magazine) who changed the trajectory of her life by entering into Zen practice at Zen Mountain Monastery in 1994. From her unique dual perspective of seasoned art observer and practicing Zen Buddhist, Larson is the perfect chronicler of John Cage’s richly lived life and inspirational work. This book has been a fifteen-year journey into the world of John Cage, who was teacher to so many, and who taught me, too. As real Zen teachers do, he modeled a way of life for me. This kind of teaching doesn’t need physical proximity. It is best displayed within the life of the person who teaches. What choices did he make? Why did he make them? What questions did he ask? Cage modeled a life that lives on in the daily moments of those who knew, loved, and were taught by him. I had been taught in the schools that art was a question of communication. I observed that all of the composers were writing differently. If art was communication, we were using different languages. I was tremendously struck by this. And then something really extraordinary happened. Lou Harrison, who had been doing research in early English music, came across a statement by the seventeenth-century English composer Thomas Mace expressing the same idea in almost exactly the same words. I decided then and there that this was the proper purpose of music. In time, I also came to see that all art before the Renaissance, both Oriental and Western, had shared this same basis, that Oriental art had continued to do so right along, and that the Renaissance idea of self expressive art was therefore heretical. I felt that an artist had an ethical responsibility to society to keep alive to the contemporary spiritual needs. I felt that if he did this, admittedly vague as it is a thing to do, his work would automatically carry with it a usefulness to others. We were artisans; now we’re the observers of miracles. All you have to do is go straight on, leaving the path at any moment, and to the right or to the left, coming back or never, coming in, of course, out of the rain. Cage’s evolution as an artist, particularly his merging of wisdom traditions with creativity, is a personal and inspiring narrative. But in addition to a biography of Cage, this book is also a profound contemplation of the spiritual dimensions that can characterize an artist’s life. Larson delivers on the title of her book by all counts. But it isn’t so easy for me. I have not yet found a way to bring my political passions and my work as an artist into confluence. I struggled with this discrepancy after 9/11. Other artists felt that same discomfort, and a number of thoughtful pieces appeared addressing that issue. If the work that emerges from your most authentic self is non-narrative, non-political, made by one person working alone, there just isn’t an easy alignment with ideology, at least not directly. So you do your work in one compartment of your life, and you advocate in another. The Occupy movement has brought those bifurcated feelings to the surface for me again. This is a “finally!” moment for so many of us who were raised on believing in the power of bodies in the street and the impact of physical presence. This moment in time feels like a return to my roots. Like going home for a meal made by your mom—familiar and nourishing. It so happens that near the start of the protest, when the police banned megaphones at Zuccotti Park, they obliged demonstrators to come up with an alternative. “Mic checks” became the consensus method of circulating announcements, spread through the crowd by people repeating, phrase by phrase, what a speaker had said to others around them, compelling everyone, as it were, to speak in one voice. It’s like the old game of telephone, and it is painstakingly slow. “But so is democracy,” as Jay Gaussoin, a 46-year-old unemployed actor and carpenter, put it to me. “We’re so distracted these days, people have forgotten how to focus. But the ‘mic check’ demands not just that we listen to other people’s opinions but that we really hear what they’re saying because we have to repeat their words exactly. “It requires an architecture of consciousness,” was Mr. Gaussoin’s apt phrase. For me, living a few hundred miles from Zuccotti Park, it started with constant monitoring of the twitter feeds for #occupywallstreet, #ows, #occupyboston, #rootstrikers, #globalchange. Then Boston came on line. I expanded to helping out with donations and food. 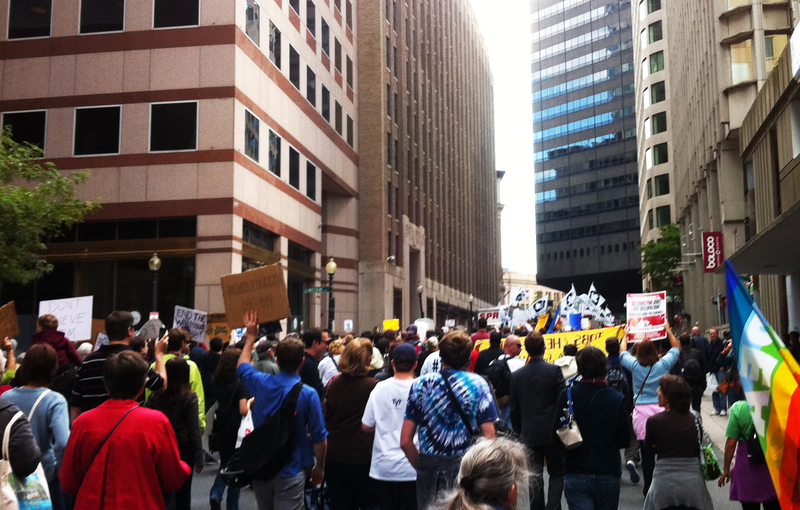 But on Saturday it moved out of virtual and into the visceral when I stood with thousands of others in downtown Boston to protest a dysfunctional world. How can you not want things to tilt towards a better direction, towards the creation of a world that is just, sustainable, good? How can you not be hopeful we can do better? The twentieth century will be chiefly remembered by future generations not as an era of political conflicts or technical inventions, but as an age in which human society dared to think of the welfare of the whole human race as a practical objective. I have found comfort in that quote for years, and now another good sign is Steven Pinker‘s exhaustively researched and important new book, The Better Angels of Our Nature: Why Violence Has Declined. Is it counterintuitive to believe a better world is possible? Our perceptions are deceptive. 24/7 news coverage is skewed to the negative. How can anyone get the full picture? So it’s Monday. Back to work. On both fronts. even if they don’t want it. have heard, no eyes have seen. down there where the spirit meets the bone. In talking about Miller Williams’ poetry, Leon Stokesbury refers to the central paradox of his work, that “humankind is compelled to seek what is true and meaningful about existence and the universe, yet has only observation and reason as aids.” To which I answer, of course we have more aids than those two. But we don’t know how to describe what they are or how to employ them powerfully. Part of being a painter for me is to seek out those other aids, and the seeking often takes place in that zone beyond language. But it is happening. So. Slowly. “The sound experience I prefer to all others is silence,” he says in this short clip on You Tube. And for most of us on the planet, says Cage, the sound of silence is actually traffic. He rhapsodizes that the sound of traffic is constantly modulating and cannot be predicted. “I don’t need sound to talk to me,” he says simply. My favorite vignette about Cage has always been the one that I heard during a Laurie Anderson performance. Asked to interview him for the Buddhist magazine Tricycle, Laurie was intent upon asking him a really difficult question: Is life getting better or is it getting worse? I’ve been in a deep relationship for months now with Lewis Hyde’s rich and fragrant book, Trickster Makes the World. Yes, fragrant. That’s how it feels to be enraptured by this amazing volume in all its lush, verdant and seductive power. While it can be approached with the traditional “start at the beginning and read to the end” sort of treatment, it has a more rhizomatic appeal to me, one that invites you to just open it up and bite down into the deliciousness anywhere, everywhere. And I’m needing deliciousness of the deep kind right now. A few more thoughts gleaned from the Guggenheim show, The Third Mind. This show was as closely aligned to my view of artmaking as any other exhibit I’ve ever seen. The experience is still reverberating for me several days later. 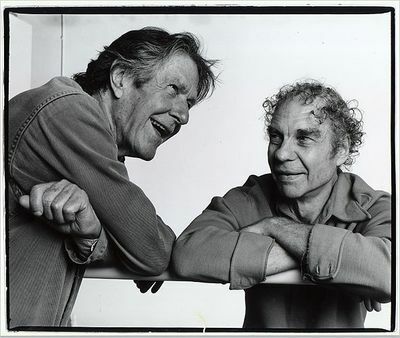 Here are some provocative words from two giants, John Cage and Philip Guston. We learned from Oriental thought that those divine influences are, in fact, the environment in which we are. A sober and quiet mind is one in which the ego does not obstruct the fluency of things that come in through the senses and up through one’s dreams. Our business in living is to become fluent with the life we are living, and art can help this. Art is not self expression but self alteration. Look at any inspired painting. It’s like a gong sounding; it puts you in a state of reverberation. To will a new form is unacceptable, because will builds distortion. Clear the way for something else—a condition which…resists analysis—and probably this is as it should be. Having just gone through a stack of recent art periodicals—Modern Painter, Art on Paper, Art Papers, Art Forum—I can categorically say that the number of times I felt connected to (compelled by? curious about? impressed with?) the art being written about or advertised is at a lifetime low. After a while you feel like a lonely dingy, trying to keep from capsizing while the noisy regattas, festooned and extravagant, barrel past. Ahoy! Any other small craft out there? It may be that all the art regattas are being pulled ashore, now in storage until the next good breeze season is upon us once again and we are through this particular patch of bad weather. Dingys are all season vessels, too small to notice or worry about. And there is something to be said for that durability and agility. For the first time in quite a spell, today’s Times brought news of two shows in New York that feel dingy-friendly: The Third Mind: American Artists Contemplate Asia, at the Guggenheim; and Pierre Bonnard: The Late Interiors, at the Metropolitan. Both shows are up until April 19. The influence of Asia on American art is a fascinating topic and one that I have studied for some time. The Transcendentalists were digging into Asian spiritual traditions as early as the 1840s, with accounts of Emerson and Thoreau reading the Upanishads and the Bhagavad-Gita. Japanese prints made their way into American visual consciousness, many by way of Paris-based artists who were captivated by a different concept of pictoral space as portrayed in Ukiyo-e wood cuts. 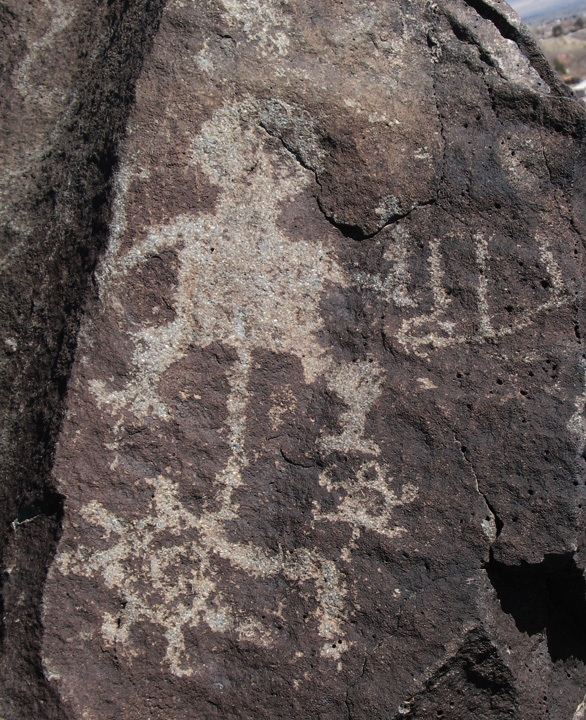 That meme’s influence has continued, showing up in a wide variety of facets of American art. And it is an influence I resonate with deeply—one that features the meditative, the mysterious, the nonlinear and nonrational. And Bonnard. He’s the colorist whose work never ends in pleasuring the eye. One of Bonnard’s signatory flairs was his insistence in placing a stripe or patch of bright orange in every painting. He is, after all, the master of the secondary palette—those colors that result from mixing two primary colors—the purples, the greens, the oranges. Tobey’s art is sometimes taken as a precursor of gestural abstraction in New York. And the case for linking some forms of Abstract Expressionism with Asian writing has been made and unmade many times. With its lineup of Pollocks, Motherwells and Klines the show pushes the argument forward again, though without adding anything startlingly new to it. Instead its surprises come from the West Coast. There’s a gorgeous painting by Sam Francis, who lived for a while in Tokyo, of what looks like a lotus on fire. Lee Mullican’s “Evening Raga” has the note-by-note shimmer of Indian music. And his friend Gordon Onslow-Ford, a spiritual omnivore who painted on a ferryboat in Sausalito and wore “visionary” like a campaign button, offers a kind of abstract version of “Starry Night,” all filigree webs and wheels. By the time this piece, “Round See,” was done in 1961, John Cage had been painting, composing and proselytizing his customized version of Zen for years. A section of the show is dedicated to him, or rather to a concept he embodied, one absolutely central to Asian culture: the idea of lineage, the transmission of forms and knowledge from mind to mind. Cage developed his aesthetic of chance operation in part through study with the Zen scholar D. T. Suzuki, and shared what he learned with contemporaries like Robert Rauschenberg and Jasper Johns. A Rauschenberg combine called “Gold Standard” (1964) was slapped together in a matter of hours on a Tokyo stage as Cage watched. But Cage’s creative DNA also passed on to a generation of younger, Zen-tinged, Neo-Dada artists who used the group name Fluxus. Work by several of them — Nam June Paik, Yoko Ono, Alison Knowles — is assembled near Cage’s, along with a ready-for-the-future-travel suitcase packed with Fluxiana. Traditional Zen painting is black and white. By contrast, Tibetan Buddhist art comes in vivid colors, which made it naturally attractive to artists and writers taking drugs in the 1950s and 1960s. Some are indelibly identified as Beats. Jack Kerouac, with sketchy bodhisattvas and a manuscript slice of “Dharma Bums,” is one. So is William Burroughs, whose esoteric cut-and-paste work called “The Third Mind” gave the show its title. There are a number of free-radical types like him in the show, which is one reason it has a patchy, scrapbookish look. Even the section devoted to Minimalism resists the sort of uniformity that art history, ever straightening and cleaning, tries to impose. Ms. Munroe [the show’s curator] finesses the problem by inventing a category she calls ecstatic minimalism, which covers expected figures like Robert Irwin, Ad Reinhardt and Richard Tuttle, but also admits personally expressive works like those of Agnes Martin and Yayoi Kusama, and makes room for excellent artists like Natvar Bhavsar , Zarina Hashmi and Tadaaki Kuwayama, so seldom seen in big mainstream shows that they’ve barely been slotted at all. Into this charmed circle Ms. Munroe also brings abstract artists working with sound and light, like Jordan Belson, James Whitney and La Monte Young. Whether you call Mr. Belson and Mr. Whitney optical scientists or psychic magicians, they are fascinating figures, very much in line with the Guggenheim’s own history as a museum of non-objective art rooted in diverse cultural and spiritual traditions. As for Mr. Young, he and his “Dream House,” with a 24/7 drone and trippy lighting by Marian Zazeela, have long since become underground institutions. First installed as a permanent environment in his Manhattan home in 1962, then used for performances with his teacher, the Hindustani raga vocalist Pandit Pran Nath, and now reconstituted at the Guggenheim, “Dream House” forms a natural bridge to the conceptual and performance art that brings the show to a close.